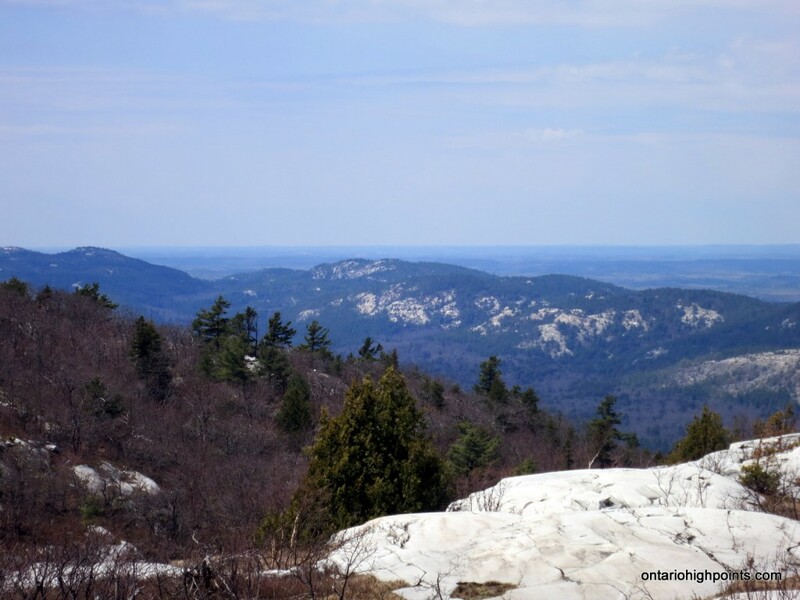 Located in Killarney Provincial Park, Silver Peak is the pinnacle of the La Cloche Mountains, a weathered 3.5 billion year old mountain range that was once higher than today’s Rocky Mountains. 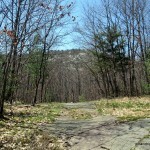 The peak is so named because of the silvery gleam the white quartzite gives off in the sunshine. 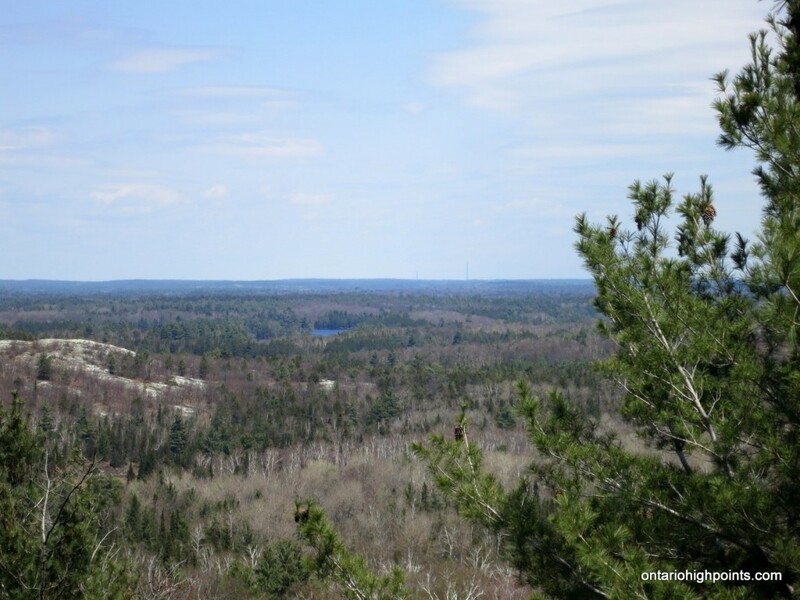 Although not the highest elevation in Ontario, the peak is well regarded for it’s mountainous terrain and sweeping views, and as such is a popular hiking destination. 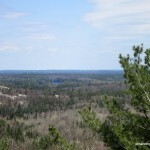 From Toronto, take Highway 400/69 north through Barrie and past Parry Sound. 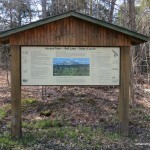 29 km north of the French River turn left (West) on 637. At kilometer 36 on 637, there will be a gravel road turn off at the right (North) to the Bell Lake Access point. 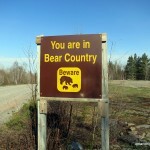 It’s a 9 km drive from 637 to the parking area at Bell Lake. 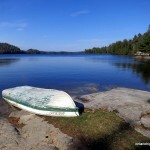 Parking permits and canoe rentals can be arranged at Bell Lake. Behind the Bell Lake office, bushwhack west through the woods. 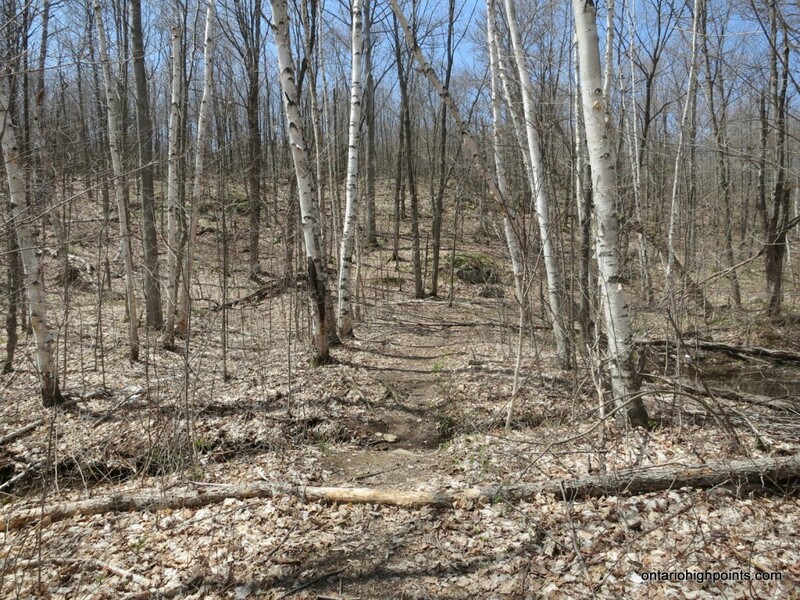 There is very little sign of the old logging road here, but the woods are fairly easy to traverse. 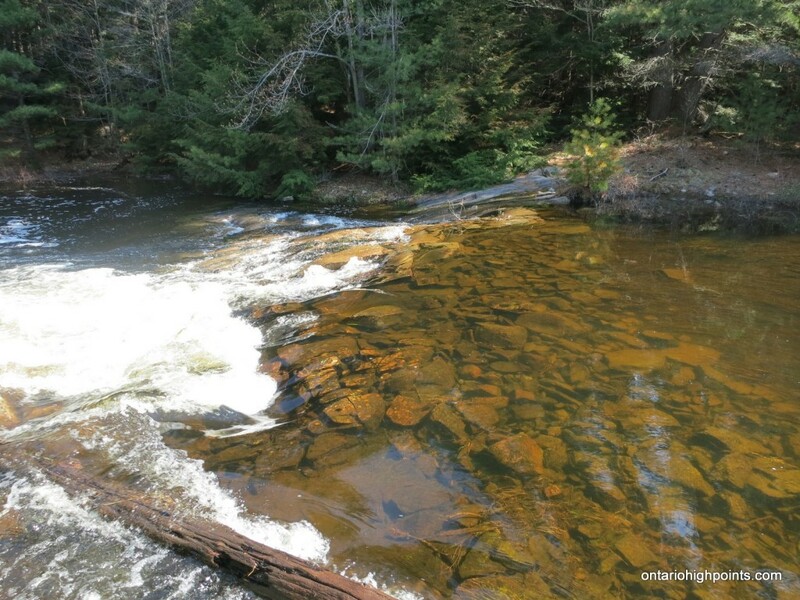 1 km from the parking lot, you will encounter a creek that must be crossed: either across rocks when the water level is low or by fording if a dry crossing is not possible. 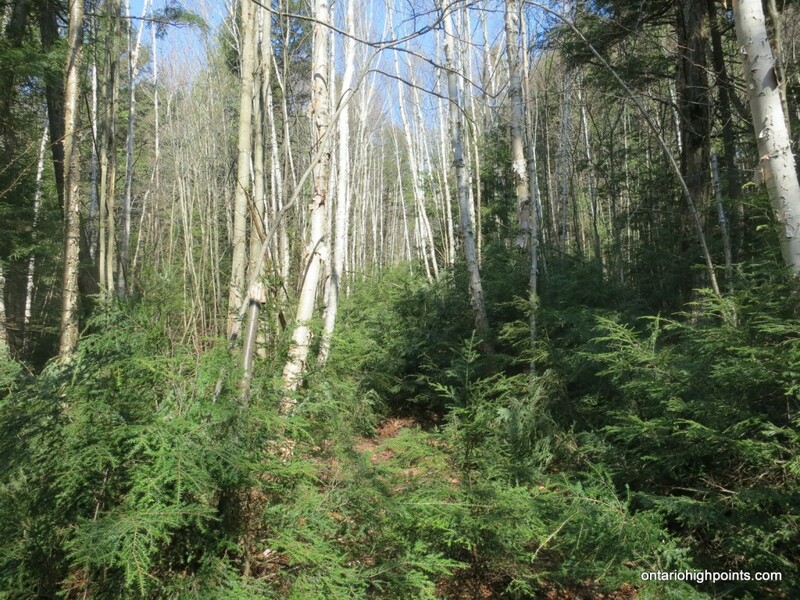 Just beyond the creek, you will intersect with the old logging road, much of it overgrown with young hemlock trees. You can optionally follow the road or bushwhack west through the mostly deciduous forest. Skirt south to avoid a section of blown down trees and continue west to a second creek crossing, which lies 1.9 km away from the first creek. 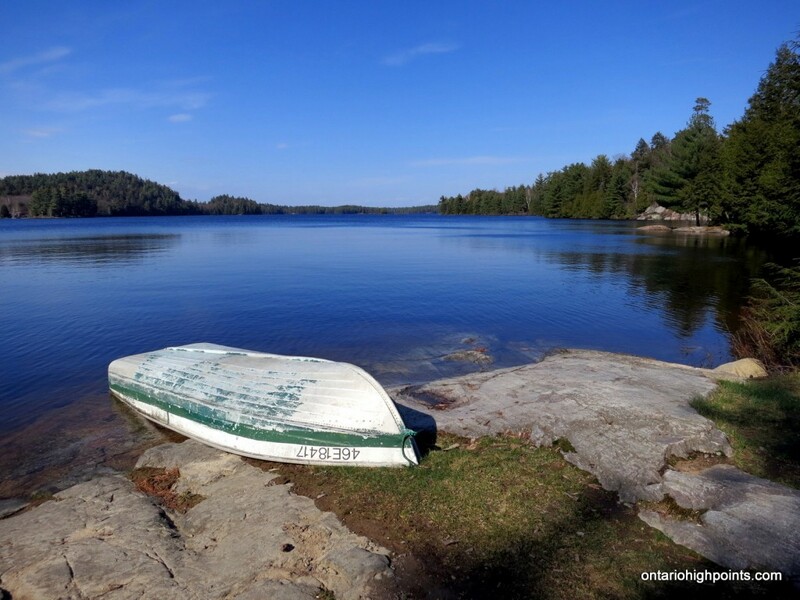 Beyond the creek, hug the southern shoreline of Bell Lake to complete the last 0.6 km of bushwhack to meet up with the Silver Peak Trail and the Bell Lake Portage. 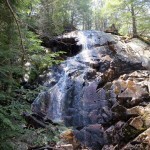 From the portage, it is a 2.3 km hike to the intersection with the La Cloche Silhouette Trail. Proceed west (right) on this generally well established trail for 1.6 km until it intersects with the Silver Peak side trail which will be on the left. 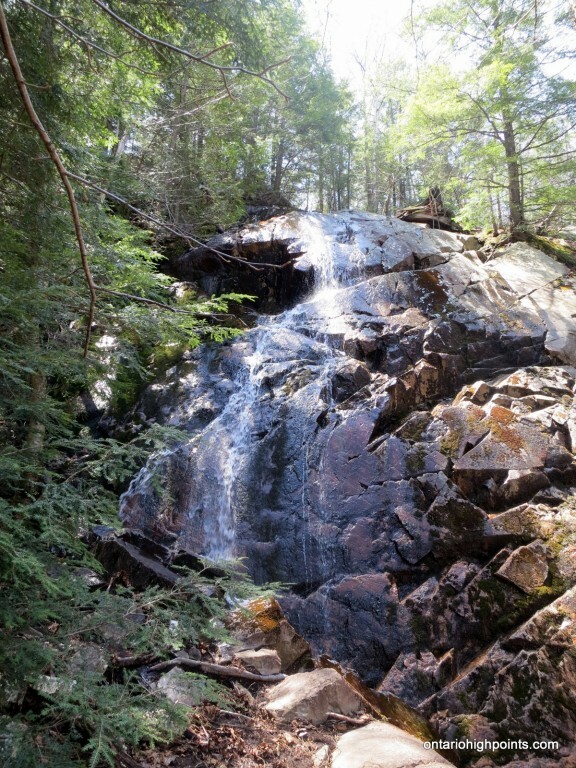 Proceed south along this trail which will climb at a moderate, but steady pace for 1.9 km to the summit. 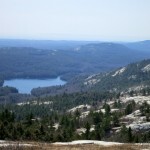 Silver Peak is a ridge with several high points. 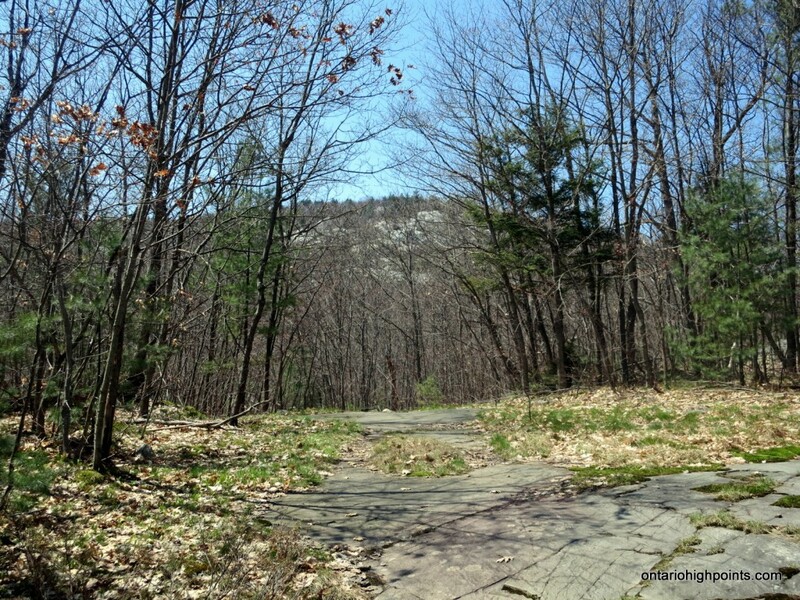 The highest is nearest the trail and is marked by the footings of a fire tower which once stood on this spot. 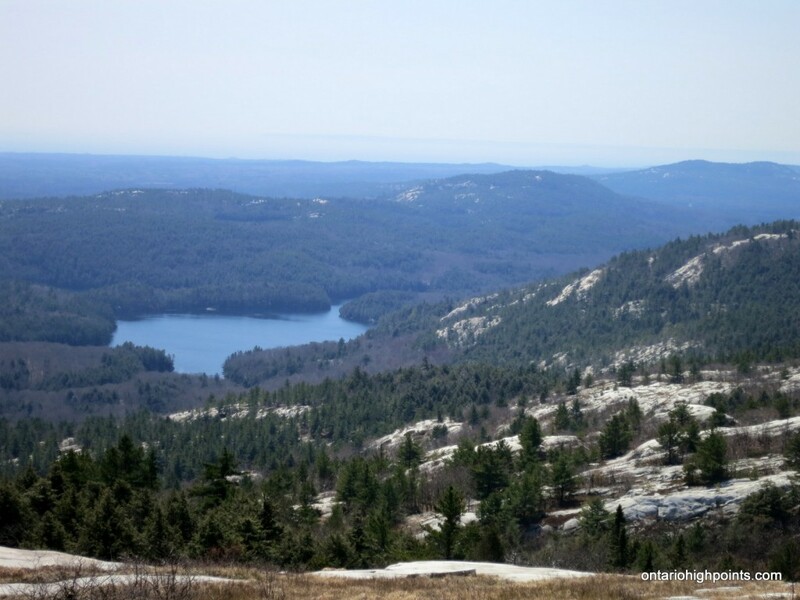 On my previous trip to Silver Peak, I combined a short paddle along Bell Lake with a hike on the La Cloche Silhouette trail to complete the journey. This is the most common way to get up the mountain. 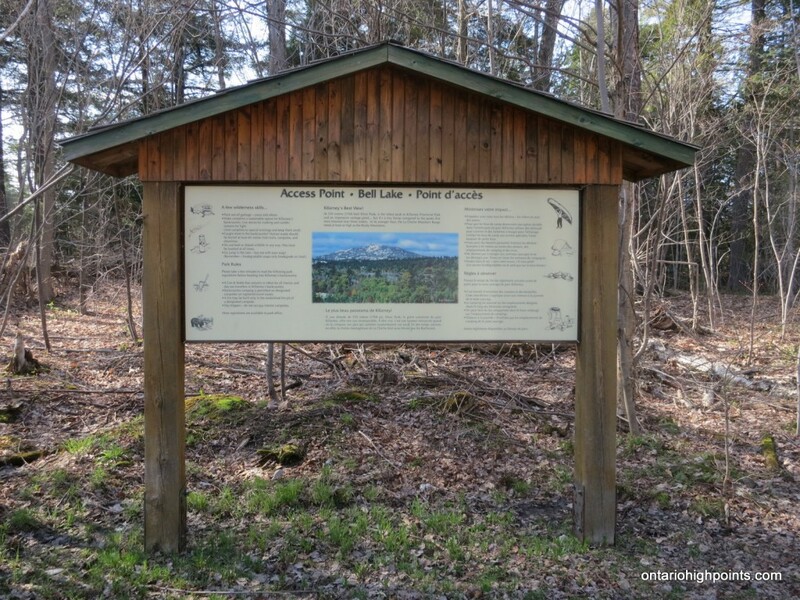 However, after hearing about a possible completely overland route via an old logging road; a path paralleling the paddle along Bell Lake, I decided to return to the area to check it out. With the “May 24” long weekend selected for the hike, I managed to lasso my wife’s cousin, Dave into joining me on another adventure. 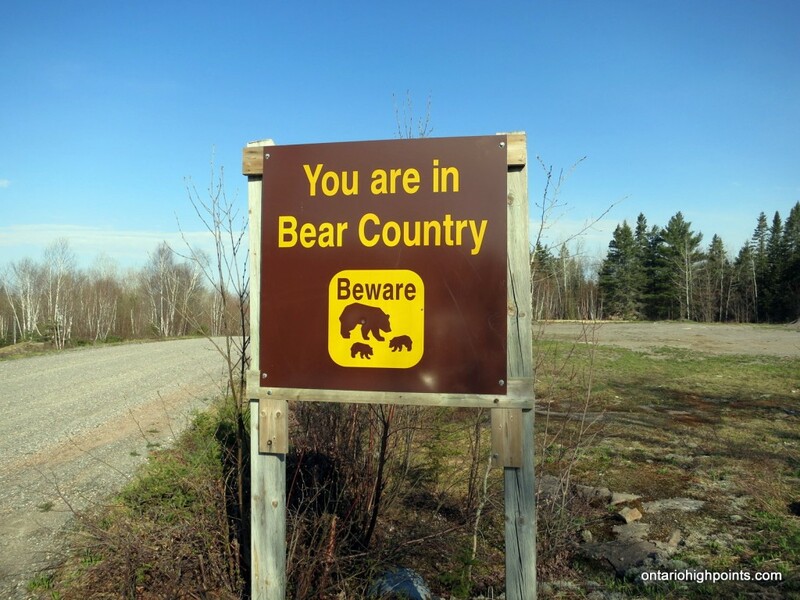 We departed Sudbury early Sunday morning and traveled south along Hwy 69/400 to Hwy 637 and eventually to the turn off to Bell Lake. Along the way we noticed that the river water levels were alarmingly high. We reached the Bell Lake Access Point Parking lot just after 9 AM. After suiting up, we set off to search for the old logging road that apparently was located on the west side of canoe office. After searching the woods for almost an hour for any sign of an old road, we gave up and headed west. 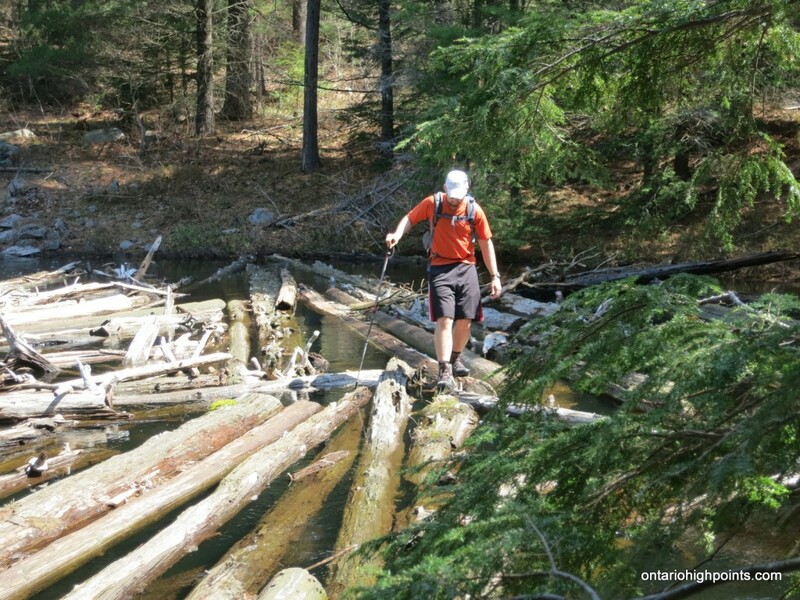 Our first obstacle was a creek draining from Bell Lake. 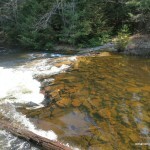 Easily crossed under normal conditions, it was swollen with water from the spring melt and recent rains. In most places the current and rapids made the creek too difficult to cross, but we finally found a spot to ford, between two sets of rapids. We pulled off our boots and prepared to cross. We used my hiking poles to stabilize ourselves against the strong current and made the potentially hazardous ford through the “refreshing” (bone-chillingly cold) spring water. 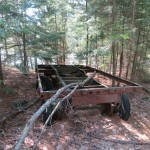 A short distance from the creek, we finally found the old logging road. 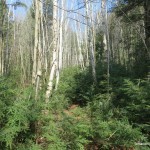 It was quite overgrown in spots with young, thick hemlock. Against the leafless spring trees, it appeared as a ribbon of green through the forest. We followed it west and encountered occasional flags of surveyors tape, left by a previous traveler. Sometimes the road was too overgrown to pass through, so we often found ourselves bushwhacking alongside the overgrown road, instead of on it. We followed the overgrown logging road in a roughly westerly direction for 2.5 km, where we came upon the portage that runs from Bell Lake to Log Boom Lake. 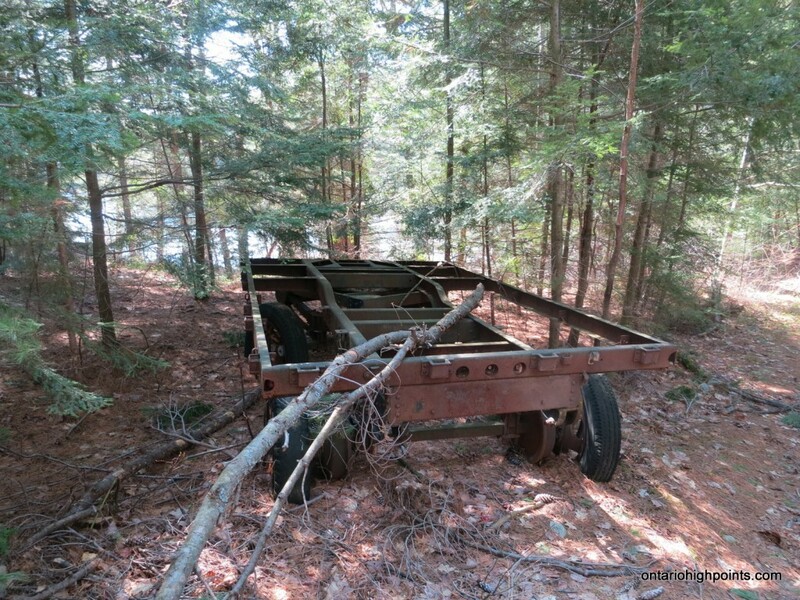 After checking out an old trailer, a relic from the logging days in the park, we resumed our bushwhack west to our next major water obstacle. We arrived at another creek which also drained Bell Lake. 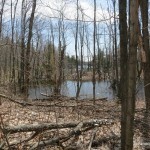 It was wider and deeper than the previous creek, and with the torrent of water, we couldn’t find a good place to ford. 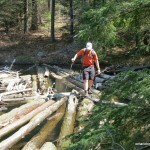 We decided that with some small enhancements, a log jam near the mouth to Bell Lake looked stable enough to cross. Although walking along unstable , partially jammed logs was a bit sketchy and not for the faint of heart, we managed to cross without injury and without getting wet. 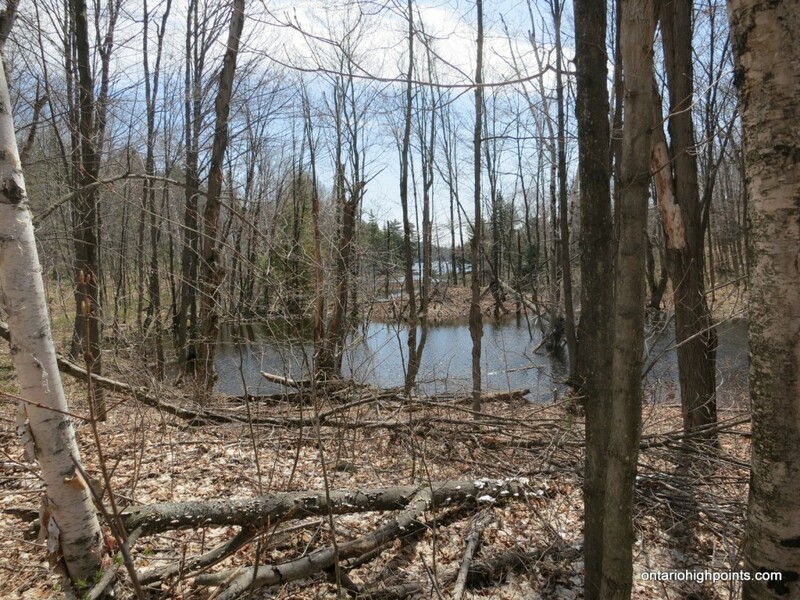 After the log jam crossing, we continued along the overgrown road which turned south and then west. I was keeping track of our position on my GPS and noticed we weren’t going to intersect with the Silver Peak trail, so we decided to abandon the road and headed north. A short bushwhack later, we emerged onto the start of the Silver Peak Trail located at the far west end of Bell Lake. 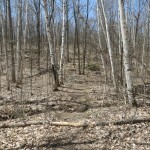 The Silver Peak trail was wide and easy to follow through the still leafless forest. 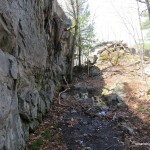 With no water obstacles, we made quick time to where the trail converged with the La Cloche Silhouette trail and followed the trail west. After 1.5 km, we reached the side trail turnoff to Silver Peak. Turning south, we began the ascent up mountain. After passing several groups of hikers, we started to get the impression that we would be sharing the views with many others who were also using their long weekend to climb the peak. As we neared the top, we started to get views of the quartzite rock outcrops of Silver Peak Range and also views north towards Sudbury which was faint in the distance. 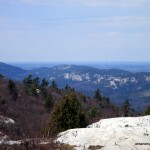 A short time later, we arrived at the summit and enjoyed the spectacular 360 degree views of the La Cloche Mountain Range.. 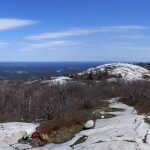 The summit was crowded with hikers, most of whom were hiding from the winds just below the summit. Dave and I enjoyed some snacks and refreshments and then after taking the required photos headed back down the mountain. We descended Silver Peak, passing more than a few groups on their way up, and after 1.5 hours arrived back at the start of the Silver Peak Trail / Bell Lake Portage. We decided that since the old logging road was so overgrown and indirect that we wouldn’t make a big effort to stick to it on our return trip. We set a compass course for east and hiked back, sometimes on the overgrown road, but often bushwhacking through the woods. After retracing our steps across the log jam, we bushwhacked east and then southeast through the woods, having to avoid some treacherous sections of blown down trees and thicker bush. 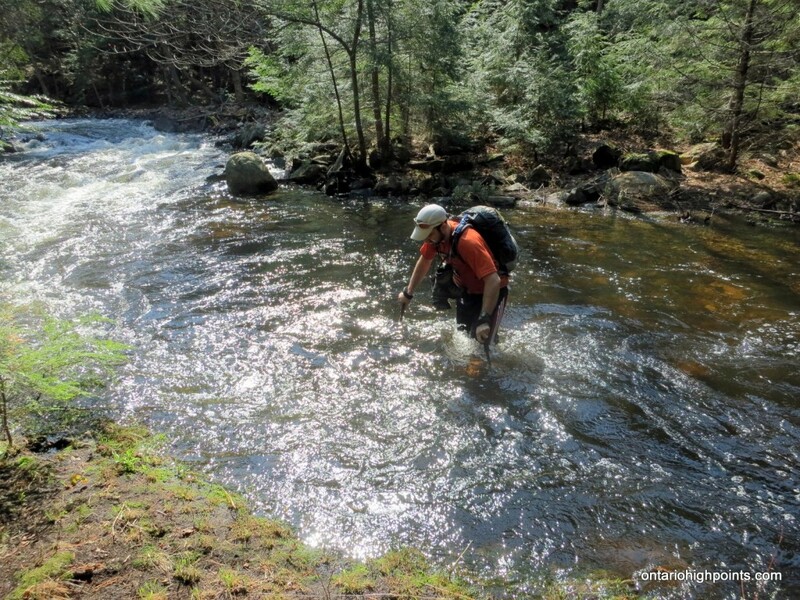 We soon arrived at the creek, where we again removed our boots and forded the creek. A short time later we arrived back at the Bell Lake parking area. 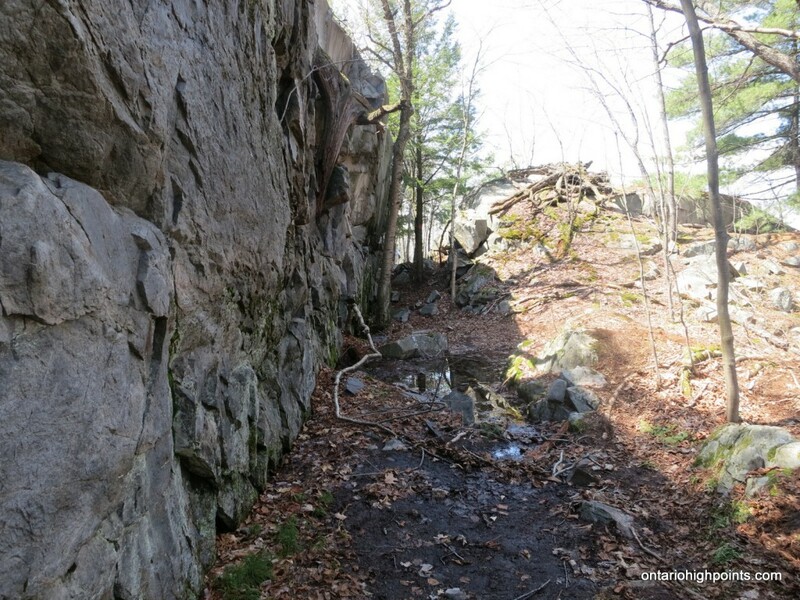 Just tried this route yesterday (April 19th, 2015). I don’t recommend fording the first creek cuz water temperature was way too low. On our way back, we found a huge fallen tree not far away from the fording point. 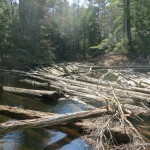 So don’t ford instead follow the stream about 50 meters down and cross using the fallen tree trunk. We did reach the second creek and decided to stop there. 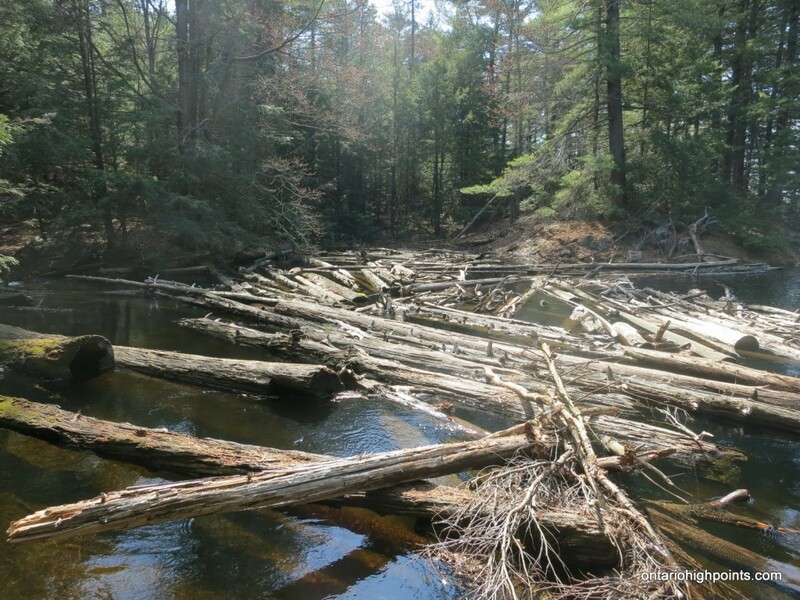 The water level was high and the current was rapid plus the logs were too slippery to step on. We’ll try this route again in the fall.